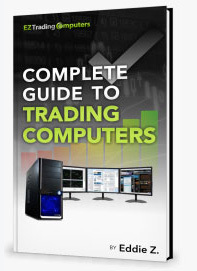 Many traders turn to laptop trading computers in order to have a reliable machine that you can trade on whether you are in your home office or in a remote location. -Is portability or ability your main priority in a laptop? -Can you have both in the same machine? The current market trends in laptops are thin, lightweight, and multi-use. While these all might seem like alluring features, how does this affect the internal hardware that you are paying for? Often, you end up paying for convenience features, like “convertible”, “smallest on the planet”, and “touch display”, that offer you absolutely no advantage or improvement in your computer’s ability to manage your trades. The best laptop for traders contains a delicate balance of both portability and ability. It doesn’t need to be razor thin, because, frankly, a powerful processor isn’t going to be able to fit in a laptop of that size. I can’t justify sacrificing the most important components for traders just to have a laptop that weighs 2 pounds instead of 5 pounds. The computer industry can make it difficult to easily understand the ability, power, and speed a given desktop or laptop contains. There are literally over a thousand processors. Typically Intel identifies their different levels of processors with terms like i3, i5, and i7. Each processor level has very different capabilities. An i3 offering basic abilities, i5 is mid-level, and i7 is their most powerful. However, within each of those levels are hundreds of processors that bear those prefixes. Because of these issues, CPU benchmarking is often used as a way to score a processor’s ability and easily compare processors of different brands and models. In my guide to trading computers, I explain why trading requires a minimum processor benchmark of 7500 (You can download it here). *Range indicated when processor upgrades are available. **CPU benchmark score information obtained from cpubenchmark.net. All of the retail models in the list above have i7 options. Notice how the benchmark scores top out at 5,000. That’s 2,500 points BELOW the minimum for trading. That’s a huge difference! The bottom line is that in a laptop we all want a machine that’s not going to cause you back problems while you travel. But, superficial features aren’t worth the sacrifice in ability. For me, it’s function first and form second when it comes to my trading laptop. I’ll take a slightly thicker machine that weights a few pounds more than the ultra, paper-thin models any day. I want to know that I can pop open my laptop, trade easily and get on with the other priorities of my day.